This is not an unusual reaction or statement—almost all our clients who sail on AmaWaterways feel the same—they like being part of the AmaWaterways family. So, let’s explore why this special company makes folks feel part of the family—how can they create an experience so special folks want to be known as members of the family? We have known the two owners since 2011. We first met on a Tulip time cruise. Our most recent meeting was when they were honored at the 2018 TravelAge West Awards ceremony. Kristin and Rudi were honored with the top award of the gala night for a lifetime achievement award for leadership in the river cruise industry and the travel industry. It was a great night for the company—they won several other awards. We were proud to be part of it and even prouder to be the only other company to win an award as a couple during the entire award ceremony—all the other winners were individuals. However, as great as awards are recognizing AmaWaterways as a special company, it is the tone they set for the company that makes the difference. They set out to create a river cruise company they would want to sail on themselves and they have succeeded beyond even their lofty expectations. As a retired Army officer and a retired highly successful football coach (ok I did win a state championship as the 2001 defensive coordinator of the Bellevue Wolverines), I really understand what makes an organization perform at the highest levels. It is a combination of good leaders, staff that care and do their job in a superb manner and a fantastic product (great food and wine, luxury accommodations and well-designed excursions and experiences). Anne with Lazlo—great, friendly service by profesionals who care! All the folks who work at AmaWaterways look to exceed your expectations—the culture of the company is consistent excellent, always improving and a genuine desire to make your vacation the best possible. 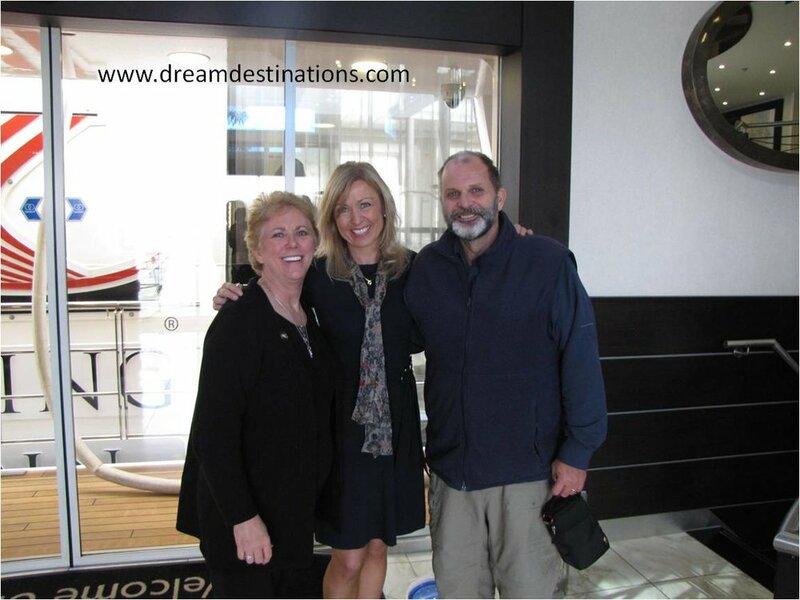 It is amazing how both clients and travel professionals talk about their experiences with AmaWaterways—words like friendly, proactive, professional, caring, cool always seem to be used to describe their experiences. You know this company is on the right track when positive words, unsolicited, are used in interactions with others when talking about river cruise companies and AmaWaterways almost always receives positive accolades. .
You are a guest that instantly becomes family—veteran cruisers often look for crew members who took care of them on past cruises. Some are even Facebook friends. It is a genuinely warm, welcoming and fully professional staff. Every effort is to enhance your comfort, your experience and the trip. They care and it shows. The Bar Staff—Miro, Peter and Tomas—what a crew! Trust me, you will fondly remember the staff. If I was only allowed to pick one factor that is a difference factor among river cruise lines, it would be the staff at AmaWaterways—each performs their role superbly! · The staterooms are relaxing, well-appointed and spotless and inviting; especially if you have a twin balcony cabin—you will enjoy your new luxury haven. Who wouldn’t want to stay in a relaxing stateroom like this? · As you glide past stunning castles, steep vineyards and medieval towns and villages on your well-designed rivership, the unexpected luxury will help you relax and refresh while seeing amazing sites. Castles on the Rhine River Gorge—memorable beyond words! · Tempting, exquisite cuisine at all meals but especially the 3/4/5 course diners which are balanced with regional dishes, and time-honored favorites that are always paired with fine local wines—that means you will dine well! Combine this with the included culinary experience of a chef preparing a gourmet meal, and you will rave about the food during and after your cruise. Anne’s meal on an AmaCerto—great food! · Tours that delight—small groups led by knowledgeable guides, organized by pace (gentle, regular, fast and even late-risers) that help you experience a destination, not just see it. Hunting for Truffles in Provence—such a cool tour! If you ever want to be part of a profession that is under constant scrutiny, coach football at the high school, college or Pro levels. Almost every coach soon learns, you have to keep improving every day or you won’t win games. So, with that being said, I recognize companies that work every day to get better. Without a doubt, AmaWaterways is top of the list in the Europe river cruise industry, in my humble opinion, because they have adopted this attitude in the products and service they offer to their clientele. It shows every day on your cruise. Here is a small list since we began sailing on with them since 2009. On ever sailing on every ship, there will always be an obstacle that needs to be addressed to ensure a smooth sailing. Most are handled behind the scenes but let me relate two stories that show just how exceptional this company is at handling difficult situations. A recent client, traveling solo in 2018, developed food poisoning just prior to embarking on a 14 day cruise at Budapest. He tried to tough it out but finally, on the next day, told the cruise manager. She immediately jumped into action and arranged a doctor appointment in Bratislava. She accompanied him, translated as necessary, and got him the medicine he needed (he quickly recovered and enjoyed the rest of the cruise). He was stunned—no extra charge, just doing right by the client despite her busy schedule (if you have every sailed on a river cruise, you know how busy cruise managers are—they never stop for 7 days!). Now that’s excellence! In 2014, we witnessed probably the best river cruise adjustment I could ever imagine. We were set to cruise from Arles to Lyon on a French Provence Rhone River cruise. Due to a high water situation, the rivership was trapped—it could not pass under some of the low bridges without causing a wreck. AmaWaterways decided to send the entire group of us to Lyon by high-speed train and then cruise to down to Arles and back to Lyon in one week. Basically, we got 2 trips in one, sailing the Rhone in both directions, without the loss of any port excursions or activities. As a travel professional, I can’t begin to tell you how hard this was—every tour had to be rescheduled, food provisions and supplies had to be re-coordinated and adjusted. It was amazing—they pulled it off like it was business as usual. Here is some of the crew who pulled off that wonderful 2014 cruise—amazing adjustment! Wow, what a company! I would encourage you to become a member of the AmaWaterways family. Trust me, go on a river cruise with them and you will be glad you did—they will gladly adopt you as a new and valued family member! We are travel experts, ocean and river cruise experts, and Europe destination experts. We have first-hand knowledge of almost anywhere you want to visit in Europe. We know our products and the vendors who sell them to you. We have designed special tours for dozens of clients, led several and will continue to find just the right vacation that will exceed your expectations like an AmaWaterways river cruise. When you are spending your hard-earned money for a vacation, you want an advisor who can match you with the right trip. You want someone who will understand your expectations and fuel your anticipation (or excitement) to get you the best possible trip experience. And, you want someone who can help you with the decision-making process. We think we have all these qualities.